As is in most cases, the original was better. The animation is just like the first one. I loved the Baby powers. He was funny as was his interaction with Edna. Wished there had been more Edna. Interesting theme of women’s roles in society from the perspective of a modern mother as well as a teenage girl, just entering the fray. I had a couple chuckles. I wish I had watched the first one and THEN this one. I could not, for the life of me, remember the other one’s ending. For me, that is telling of the worth of the original, but who am I to complain? This should NOT win for best animated feature over Spiderverse. No way, no how. 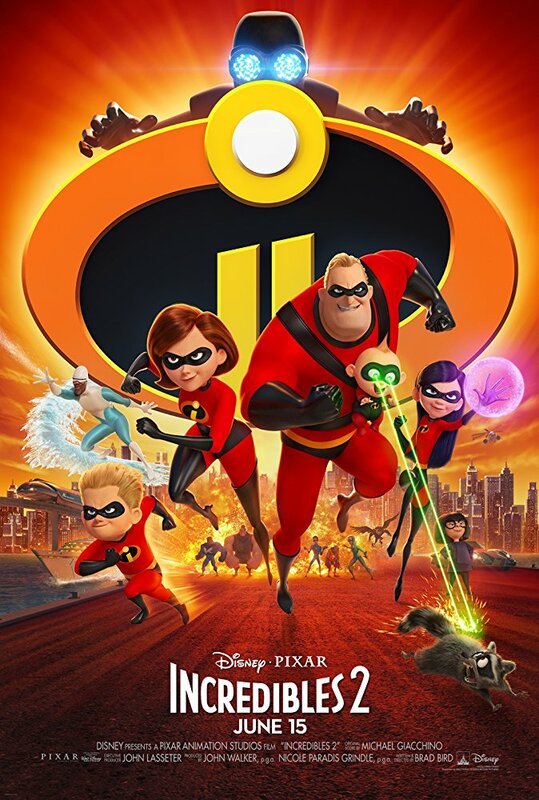 IMDB Synopsis: The Incredibles hero family takes on a new mission, which involves a change in family roles: Bob Parr (Mr Incredible) must manage the house while his wife Helen (Elastigirl) goes out to save the world. I rank this movie an 78.78 ! It received a Rotten Tomatoes rating of 93% Fresh. It received a Rotten Tomato audience rating of 86% liking it. Average Rating: 4.2/5 with a number of User Ratings: 16,103. Specs: Release date: 17 June 2018 (USA) / Runtime: 118 minutes / Budget: $200M wait… what???? At one hour and fifty-eight minutes, this is not only the longest Pixar film to date, but also the longest computer-animated feature film to date. A typo on the movie theater marquee shown towards the end of the movie reads “A113”, one of the most famous recurring Easter Eggs. Several Pixar producers and animators studied at California Institute of the Arts in classroom A113 and this number appears in every Pixar film. When Helen is in her hotel room and on the phone with Bob, there is an abstract painting hanging on the wall behind Helen. It features five swatches of red on a light background. Each swatch forms a shape with a likeness of the five Parr family members. The four representing Bob, Violet, Dash, and Jack-Jack are positioned on the left side of the painting, and the final swatch, representing Helen, alone on the right. This subtly emphasizes her separation from her family. The Safari Court, where the Parr family live during the beginning of the movie, is modelled on the Safari Inn, a venerable motel (and frequent filming location) that is only a few blocks from the official headquarters of the Walt Disney Company in Burbank, California. HIDDEN MICKEY: The spirals on Screenslaver’s hypnosis machine form a slightly lopsided, but still recognizable Mickey Mouse. Dash is seen eating Sugar Bombs, the chocolate frosted version of which is the favorite cereal of another hyperactive blonde, Calvin of “Calvin and Hobbes” fame. A neon sign can be briefly glimpsed which resembles the logo for the television show Jonny Quest (1964) which director Brad Bird has named as a profound influence on the world of The Incredibles (2004). Clips from the show also appear on television in the movie. This was Pixar’s twentieth feature film. The appearance of The Outer Limits (1963) and Jonny Quest (1964) on television confirms the movie’s time frame as the fall of 1964. Perhaps coincidentally, both shows aired on ABC, which is now owned by The Walt Disney Company. Disney, however, does not own those series, so both clips had to be licensed from their respective owners (Metro-Goldwyn-Mayer and Warner Brothers). The character Elastigirl (Helen Parr) is actually based on DC Comics Superhero of the same name. In DC, ‘Elastigirl’ or ‘Elasti-Woman’ aka Rita Farr (Notice the similarity in their last names) has the same Superhero alias and power of Helen and she is a member of the ‘Doom Patrol’ superhero team (There is also a debate that Marvel’s famous ‘X-Men’ is actually inspired by Doom Patrol). As per report, DC had given the permission to use this character name until and unless the character is used in any merchandising. Further to mention that though ‘The Incredibles’ movies are regarded as among the best Non- comic book superhero movies, similarities in between it’s characters and many comic book characters are noticeable.